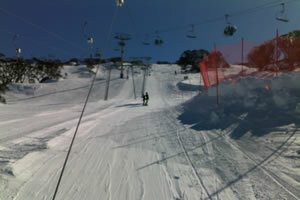 Perisher is one of NSW's premier snow resorts. It is a very widespread snow and ski playground. 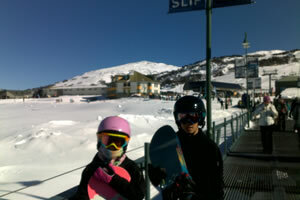 With a family in tow we found Perisher had something for everyone. As an intermediate / beginner skier the rolling mountain slopes are spread and make for the saying that the sum of the part is greater than the whole! Perisher, Blue Cow, Guthega, and Smiggins make up the parts and any could be a snow resort in it's own. The Resort is serviced by the local NSW town of Jindabyne. And because Jindabyne is 5 hours from Sydney it's harder for day trippers too. Jindabyne is around 2 hours from Canberra, so many from Canberra do make these alpine resorts area their weekend playground. 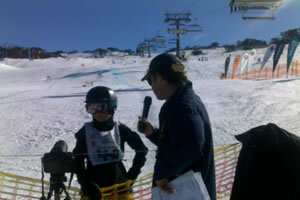 Not too many Victorians make the trek to Perisher to make it their base for the Winter Snow season. It wouldn't make sense for a Snow day trip from Victoria! There is generally plenty of snow at Perisher with enormous snow making facilities to top up the natural snow falls. And the main village area has the ultimate playground of half pipe and slopestyle course. There is so much to explore at Perisher and generally somewhere you can get out of the windy conditions if they are present. This resort recently has been taken over by US interests, after being held for a long time by the Packer conglomerate. It is a National Park and the control is via long leases. It will be interesting to see what long term plans the new owners develop. First you have to get to Jindabyne. See details on traveling to Jindabyne. From Jindabyne it's an easy drive into the Kosciuszko National Park. Make sure you have the car resort entry sorted if going early or want to avoid car queues or you can get a pass at the gate. Another way is to drive to Bullocks Flat and catch the Ski Tube. This Ski Tube is pretty awesome and particularly so in terrible mountain weather as it cuts out most of the drive. To make these price effective you need to get the early bird options very early in the year or the year before. But they even have entertainment on the Ski Tube sometimes to keep the kids and the good folk warm with laughter! We have never stayed on Perisher. The closest we have got is the Lake Crackenback Resort and then catch the Crackenback Resort Village shuttle to the Ski Tube and train it up the mountain to Perisher. This makes good sense and we found the Lake Crackenback accommodation to be super. For those on a budget you may have to share this with a family or two like we did. The Jindabyne accommodation is all okay and we got a pretty good deal at the Rydges Horizons resort via a private agreement with an owner of an apartment. But do note that we booked in January for the July school holiday period. Gorgeous resort with pool and tennis courts close to the Jindabyne so you can walk to town and overlooks the majestic Lake Jindabyne. We have always seen the accommodation on Mountain at Perisher to be too expensive and short term. There are lodges and hotels but because the resort is so spread out, once on mountain you'll probably need an oversnow taxi service to take your luggage etc. There is good general store services and a chemist etc on mountain so if staying up you can get most things at a price.